There are two main functions of your automobile: Moving forward and stopping. Often times, car maintenance revolves around those parts that keep us moving forward. From the engine, to the drive axel, and even the oil and cooling system are used to keep our vehicles operating and moving us in the right direction, but one area that can get overlooks is the breaking system. Breaks are composed of the break pads, the break lines, and the rotors or drums. Brake drums and brake rotors are not parts to take chances with. Take good care of them with quality brake rotors, brake drums and related accessories. Brake rotors and brake drums are important parts of a car’s breaking system and if there are problems with wear you could face an enormous problem if not taken care of. Brake rotors work in tandem with your brake pads to slow and stop your vehicle. Each time you step on your brake pedal, the brake pads compress the rotors with thousands of pounds of stopping power. The material in the brake pads will eventually wear down the rotors. To stay on top of this, you should inspect your disc brake rotors every 15,000 miles. Symptoms like squealing, a low or spongy brake pedal, wheel grab, or pulling to one side or the other while braking are all warning signs not to be ignored. Another sign that it’s time to replace your brake rotors is if the brake pedal pulsates on light braking. Squealing or scraping may also indicate brake trouble. Most break rotors are visible by removing the tires or with some rims, you can see right through to the rotors to see if there is wear and tear. When a rotor wares down you may see grooves in the rotor, or even a misshape to the surface area of the rotor. Not every rotor is going to wear the same way, so if you are unsure, make sure to have a mechanic take a look to see if your rotors need to be repaired or replaced. The grooves can indicate a worn down rotor. All brake rotors have a minimum safe thickness. Once the rotors wear beyond this minimum thickness, they cannot disperse the heat produced by repeated braking. If you have a warped or worn brake rotor, your vehicle will take longer to stop. Even with regular replacement of the linings, some additional service is typically required over the long haul. The surfaces of drums and discs wear unevenly in normal use and eventually need to be re-machined or replaced to work properly. 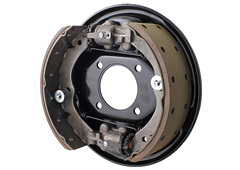 Similar to brake rotors, drum brakes work in tandem with brake shoes and can be found in the rear of some vehicles. While inspecting brakes rotors and drums, also look for signs of leaking brake fluid. Dark or damp brake dust can mean wheel cylinder or axle seal failure. Drum brakes are shaped differently. The pad pushes out towards a rotating housing to stop the vehicle. Remember – never reinstall worn brake components of any kind. Buy quality replacement brake drums and brake rotors when you need replacement. ← Car Parts – What is a CV Joint?